A new technique is suggested to determine the parameters of the physical equivalent circuit describing the metal-Schottky dual-gate field effect transistor. The method is based on measurement of the maximal stable gain factor of the transistor in different connection circuits. FILINYUK, N.A. "Opredelenie parametrov ekvivalentnoi skhemy aktivnoi oblasti kristalla polevogo tranzistora," Izv. VUZ. Radioelektronika, v.26, n.7, p.90-92, 1983. MAN, G.S.F. 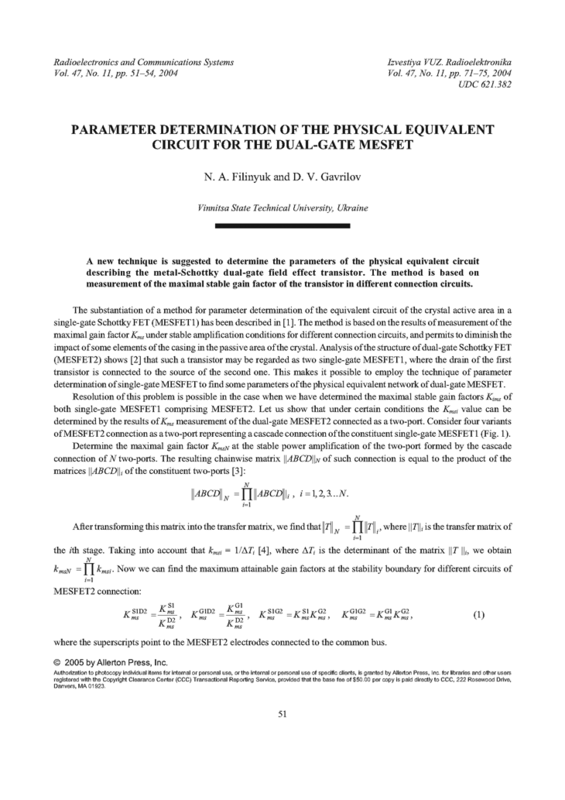 "A microwave model for the dual-Gate GaAs MESFET," IEEE MTT-S Int. Microwave Symp. Dig., р.43-45, June 1981. MATTHAEI, G.L. ; YOUNG, L.; JONES, E.M.T. Microwave Filters, Impedance-Matching Networks, and Coupling Structures. McGraw-Hill, 1969. FILINYUK, N.A. ; PESKOV, S.N. ; PAVLOV, N. "Parameter determination of physical equivalent circuit of HF transistors," Izv. VUZ. Radioelektronika, v.25, n.12, p.38-43, 1982. FILINYUK, N.A. "Eksperimentalnoe opredelenie granichnoi chastoty aktivnoi oblasti kristalla polevogo tranzistora," Izv. VUZ. Radioelektronika, v.30, n.12, p.90-92, 1987.